As church architects and builders, we at Screenflex have a unique understanding of the wide variety of different uses for your religious facility. “Our need for room dividers keeps changing,” is a statement we have heard many times. Based upon these changing needs for church room dividers and a clear understanding of your budgets, we designed, developed, and patented Screenflex Portable Room Dividers for religious facilities Our temporary walls make it possible for you to create a bible study space, worship center, meeting room for Sunday School and more. Screenflex offers a variety of heights, lengths, colors, and options in our Standard, Wallmount, and other product lines. Browse through these real-life examples of many houses of worship using church partitions to solve their individual needs. Why have so many Spiritual Leaders invested in Screenflex? Our church portable walls not only serve as acoustic room dividers to create a much quieter environment, but provide you with a versatile way to display art or flyers and manage your religious facility. 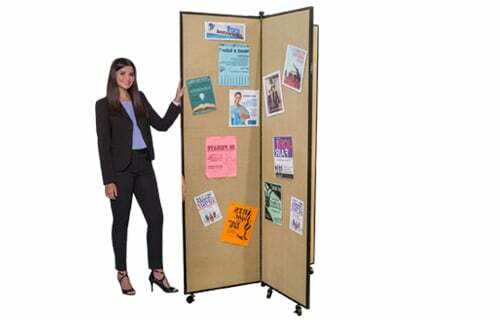 Regardless of which line of Screenflex church room dividers are your choice to better manage your church facility, all of our dividers are proudly made in our United States of America. 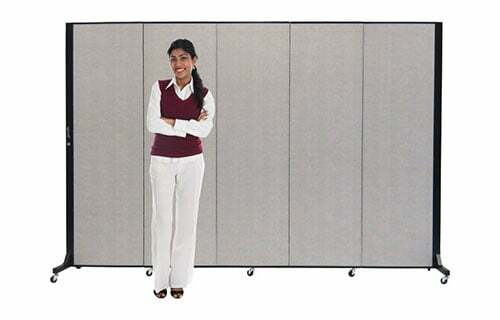 USA craftsmanship + quality parts + state of the art manufacturing facility = safe, sturdy, long-lasting school room dividers. This thinking has earned us Patent # 6892784…Stabilized Portable Room Divider. We believe people should invest their time doing what they do best. Accordingly, Screenflex ships all of our church portable walls 100% assembled and ready to use so you can focus on other tasks. With 30 fabric colors in 3 varied designs and 8 additional vinyl color selections, only Screenflex gives you such a wide variety room divider color selection amongst portable church equipment for sale. All of our church portable walls not only fold compactly for storage into an area about the size of an office chair, but also easily glide into place using ball bearing, self-leveling caster technology. What some of our Religious customers are saying…. Screenflex portable partitions are ideal for any church, mosque, temple or religious organization where a private setting is desired. Children, teens, and adults can enjoy a space a distraction-free space by simply rolling the partition into place and locking the corner casters to secure the panels into the desired position. When needing to adapt your facility space to the needs of your congregation there are several things to keep in mind when choosing a portable church room divider. Are the church portable walls versatile in their configuration and color and size choices? Screenflex dividers can be arranged in a U, L, S, round, or square shape. Partitions are available in 36 sizes and 38 colors. Our sales team is here to help you choose a fabric color to compliment your facility, whether it’s bright and colorful for children or a soft or a subdued color for a sanctuary. Screenflex tackable dividers absorb up to 50% of ambient noise in most rooms making them a practical and economical decision when redesigning your space. Consider adding a matching acoustical wall panel to your facility’s wall to absorb even more noise. All of our portable church equipment for sale is made only from the most durable, high-quality materials. We will be happy to send you a list of customers in your area to view the divider in use.